Mechanical taylor since 1919, Minganti has a long tradition in machine tools manufacturing. Traditional quality combined with advanced technologies, make of Minganti Machines the most innovative and reliable solutions for Automotive, Industrial and Aerospace industries. 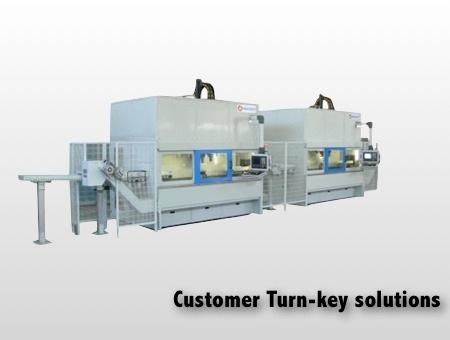 Our philosophy is to offer to our customers “MORE THAN MACHINES” and Minganti can adapt each development to specific requirements, target being always to reach the highest manufacturing productivity, efficiency and process capability, in cooperation with your technical teams, means standard turn-key solutions. Generally but mainly for Hard Turning process, Minganti has built an important knowledge in advanced industrial software’s, developing new CNC & IT solutions for more automatic and expert systems, either integrated or in close environment of the machines. With the last developments in communication, electronics, IT, automation, artificial intelligence, etc. machines will become “mastermind machines” and the future way of manufacturing will dramatically change in terms of organization, including supervision of complete production lines like “drive and monitor your process with one finger”.